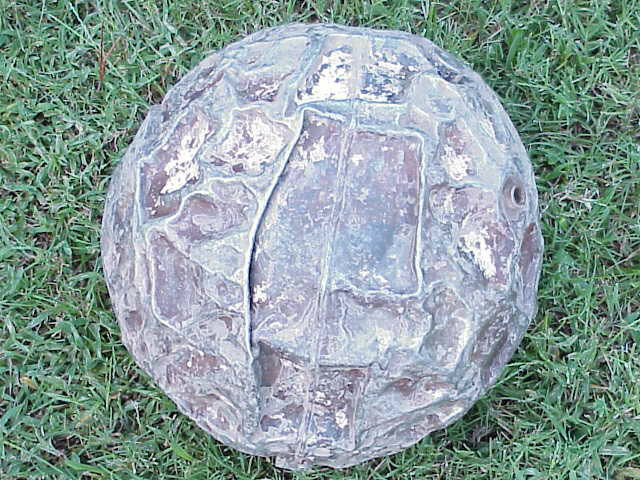 T his strange metal sphere was found washed up on the banks of the Colorado River south of Brownwood Texas in July, 2002 after some flooding. My cousins found it and thought it was weird so they took a picture of it and sent it to me. My response: 'What the heck?!!'. The more I looked at it the more curious I became, so I asked them to go back and get it and on Sept 7, 2002 they let me 'borrow' it. On Sept. 9th I took it to an industrial X-Ray shop in Dallas to find out what was inside. 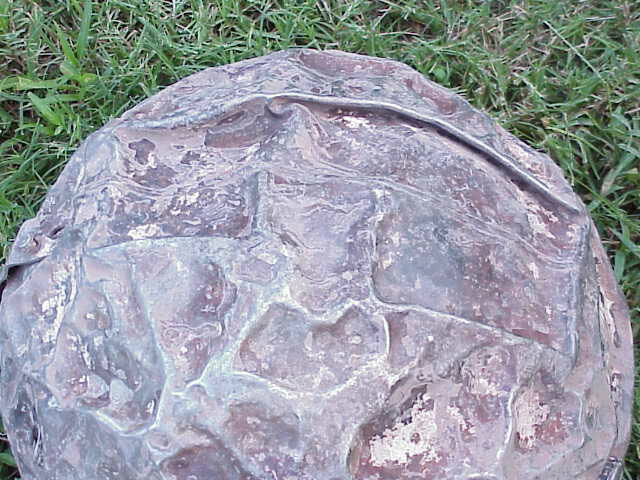 The sphere weighs about 9.5 lbs and is about 12" in diameter. 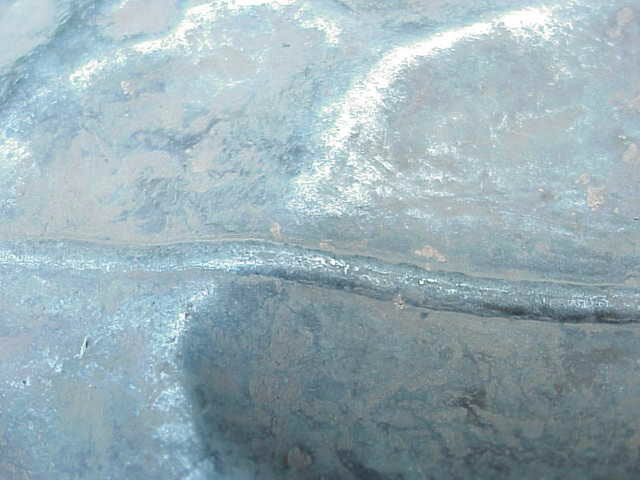 The outside is a VERY HARD nonferrous metal (maybe aluminum or titanium) which is deformed with random dents. No cracks. On the high places the metal is shiny like it's been tumbling in the river and hitting rocks, but in the valleys it's a dark brown color - possibly scorching. The dents look like they were caused from an implosion from extreme pressure. There is a perfect weld around the circumference and one end has a circular lid that has also been welded on. A handle-like piece has been welded on and bent with 2 studs that each have 3 small roll pins inserted. On the handle is the number "7052" stamped onto the metal. No other markings can be found on the sphere. Also around the sphere are 5 welded fittings that look like they are designed to accept hoses or cables. Some but not all are threaded and 2 have small wires coming out of the center but they are broken off. There is a small metal strap that is secured by a Phillips head screw which looks like it could clamp wires. Two X-Rays were taken at right angles to each other. The X-Rays show that inside the sphere there is an inner sphere which is slightly smaller than the outside (maybe 1/2" smaller in diameter) and is in very good condition with only a couple of minor dents. There is a series of 3 tubes going from top to bottom which are inside each other. The tubes have some holes in them. At the top and bottom the outer tube is secured with a bracket that has 3 legs that are attached to the inside sphere with nuts on threaded studs. There are a couple of pipes inside that go from the various fittings to the cavity between the 2 spheres and some just go through the center of the 3 tubes at one end. Another view of the large depression. One of the fittings can be seen at the 2:00 position. Shows the brown color 'scorch' inside one of the dents. Also shows the weld. This is a very good weld. Possibly an electron beam weld. This is one of 2 'studs' which are mounted on the 'handle'. Has 3 small holes with small roll pins inserted. This is the other 'stud' which is hidden under the bent 'handle'. This large cap appears welded and can't be unscrewed. 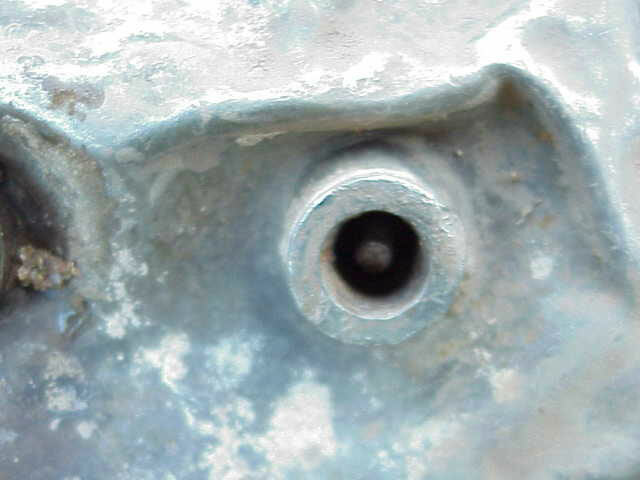 One of the fittings showing an insert or wire. This fitting has no threads and appers to open right into the cavity between the inner and outer sphere. You can see the shiny inner sphere. 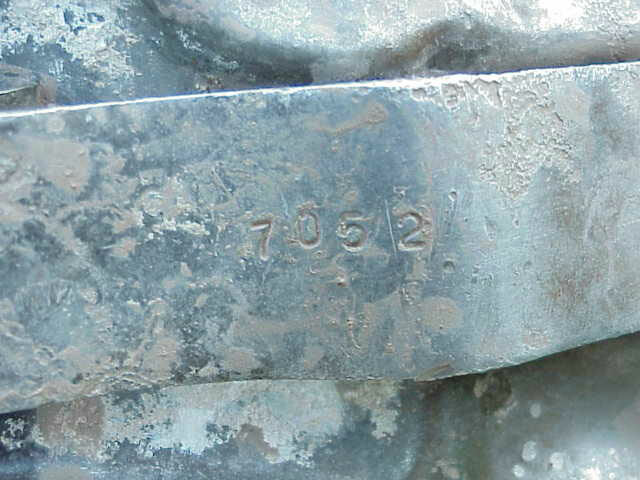 Number stamped onto the 'handle'. Here's the 'clamp' with a screw. The bright circle in the center is 3 tubes held by 3-legged brackets on each end. Around the sides are 3 hocky-pucks with coils of wire around them. One tube goes from the outside through the center of the tubes then back to the outside. Around the largest center tube are 2 square blocks connecting wires to 2 fittings. See this Super Size. Photoshop was used to invert and pull out some of the Orb's internal detail. X-Ray #2 (90 degrees from the X-Ray #1). 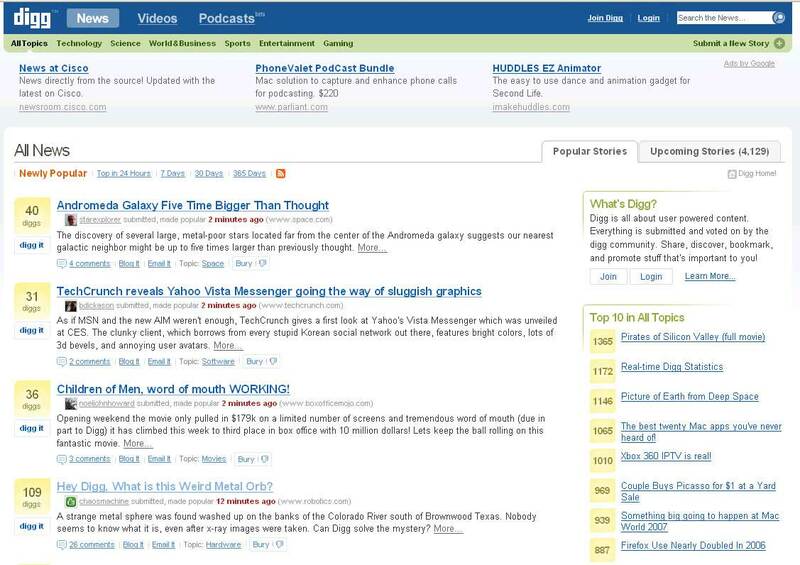 Tubes visible across the center. Weld from top to bottom. Handle is at the bottom. 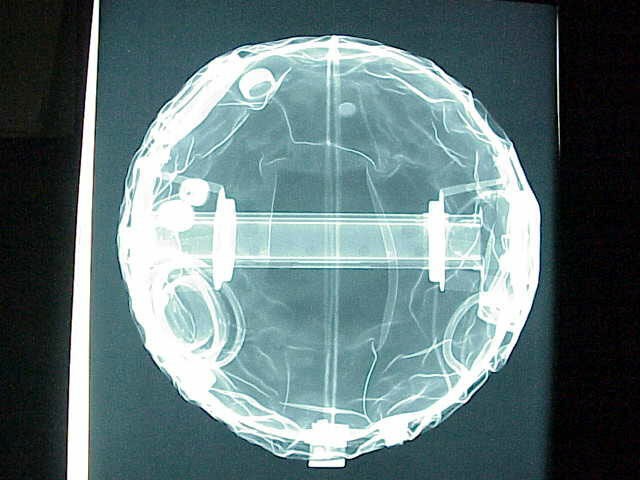 Hockey-pucks are on the left side encircling the tubes. See this Super Size. http://jasonleigh.org/van.htm Fallen Metal Sphere in Kingsbury TX. Apollo 13 oxygen tank looks like this orb! ABC News Unidentified Floating Object Washes Up on S.C. Shore. 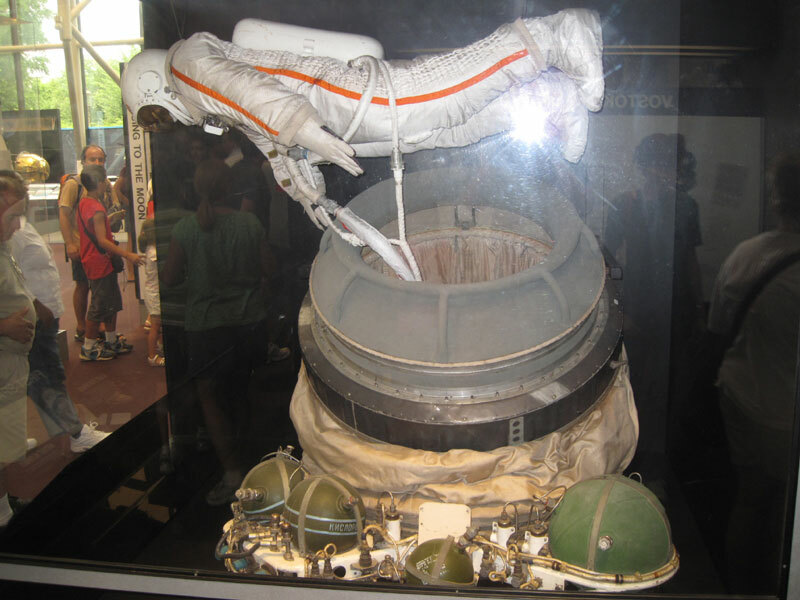 I visited the Smithsonian National Air and Space museum recently (actually on the day of the 40th anniversary of the moon landing), and snapped this photo of a Soviet spacecraft display. Roger, best guess is a nitrogen or helium tank used to pressurize a rocket stage. Too small to be a primary propellant tank.Possibly from an Ariane rocket launch from South America. Some of their stuff has washed up on Gulf beaches during the years. Hardware launched from Cape Canaveral here usually winds up on beaches to the north on the east coast or on Atlantic islands. Of course, that's assuming it's something from aerospace. That could still be something from a ship or an airplane. The guesses regarding a discarded sputnik are about the best guesses we have seen: http://grin.hq.nasa.gov/IMAGES/MEDIUM/GPN-2002-000166.jpg though, we would need some other object in the photo for scale reference. Another guess based on the location of discovery and design would make it an aquatic navigation bouy, beacon, or geological survey device of some kind - perhaps dam/river water level/temperature sensor. #1 The sphere looks like it could be someone's attempt to build an atomic (or nuclear) detonation device. If so, it's probably a mock-up - a prototype. #2 The sphere also resembles Sputnik. Could it have survived re-entry? Maybe it had a third outer shell which disintegrated. #3 Recall the Air force pilot who (apparently) deliberately crashed his bomber into a Colo. Mountain. Maybe it had some dummy warheads on it. Could be a sample slug for testing the implosion of an atomic-device. Initial atomic bombs were a 18" or therabouts sphere of nuclear material - in the 18" configuration is was above critical mass. To get the nuclear sphere to reach critical mass, the sphere was surrounded by a network of blasting caps - and when initiated all the blasting caps would squeeze the sphere to its critical mass size - and boom. My guess would be that this was a non-nuclear test unit for testing the configuration of those blasting caps. The internal structure would be bits of intrumentation that were fed through wires to recording devices. I just happened onto this article and the orb looks AMAZINGLY like Miranda, one of Uranus' 3 moons! 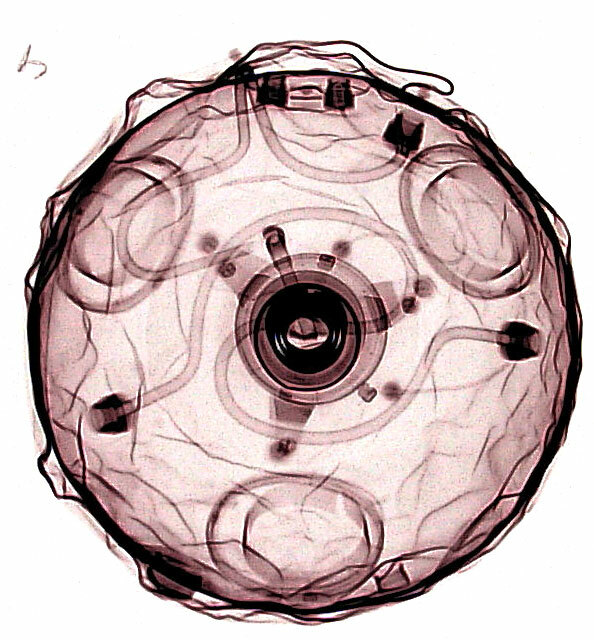 After having seen your metal orb and the radiographs, it appears very much like an ER weapon. It's lack of radioactivity is no surprise. Without nuclear materials it is simply a big chunk of metal. 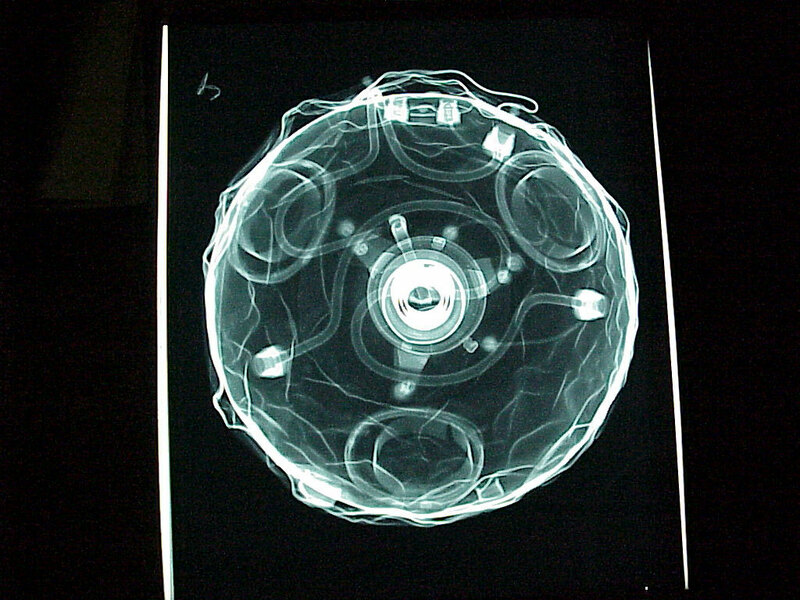 ER weapons are enhanced-radiation weapons that are calculated to throw out neutrons, which are deadlier to humans than are other forms of radiation. These weapons can be delivered in any number of ways. The are atomic explosives that are designed to minimize the blast but enhance the radiation effects. The original reasoning behind these weapons was to stop tanks. They would stop an armored attack by incapacitating the crew rather than the tanks. Given the manner in which it was found it is very likely that it was not produced by the military, but by individuals that had intended to down grade the technology to create a "dirty bomb". Why? Who knows in this day and age, but the photos and radiographs do indicate that it was created as a weapon and not as a simple radio device of some type. 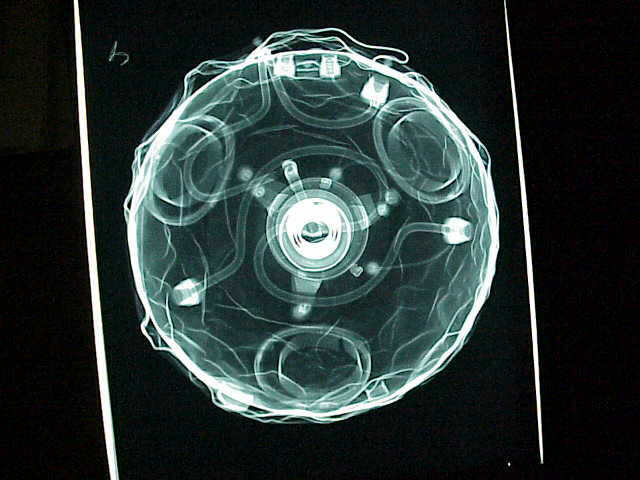 The tube in the middle is very specific to this type of device and is the actual container for the nuclear material used in the device. A guy at my office thinks he has figured it out. See: http://www.hq.nasa.gov/office/tao/History/sputnik/ 3 were made - you may have one. I'm almost sure that strange object is part of a space vehicle upper stage that re-entered, but will run it by a friend who is more knowledgeable than I am, and get his input. There are a LOT of upper stages in orbit, hundreds of them, and they occasionally re-enter, leaving debris if they re-enter over land. Could the ORB be a "Microwave Cavity" resonator as used in RADAR? It looks like a fission device: i.e. a dirty nuclear bomb. I think your orb may be an antennae float for a submarine, used for emergency broadcasts when a sub is in trouble, I believe I remember seeing one when I was in the Navy, I was a radioman on a destroyer and were taught to look for things like that when searching for subs. That would explain the wire inputs and the coils inside. After they are used they cut the wire and they just float away. Just a guess, but probably as good as any. Hello--did you ever determine what the orb was? my guess is definitely aerospace origin; maybe a fuel cell of some sort. have you cut it open? Sorry if this is outdated info, but after reading these articles (not sure where in this article exactly), it sounds as if you have found an underground military related "big brother" device. I believe they are referred to as "bees" or "spy-bees" which fly around and observe/interact with gov. employees on duty in these underground military/alien bases. Here is one page I have found relating to the orbs, http://www.government-ufo-conspiracy.com/34.htm, but it's not the one I was thinking of. One story tells of these bees bumping into the butts of employees in a humorous manner since they are virtually silent when they fly. Apparently, the construction of the bee is similar to ufo technology. If you keep researching underground bases out west, you will stumble on more info regarding the orbs. peace. I have seen the link to your site on Art Bells site and it is really a funny looking thing. The symmetry and functional simplicity of design that I see in your find suggest to me that this is a core piece of a reliable nuclear device (a suite-case bomb?) . If this is the case, the outer sphere must be made of neutron-reflecting material and may contain for example large amounts of berrilium (the presence of berriliium is a telltale signature for this type of devices). 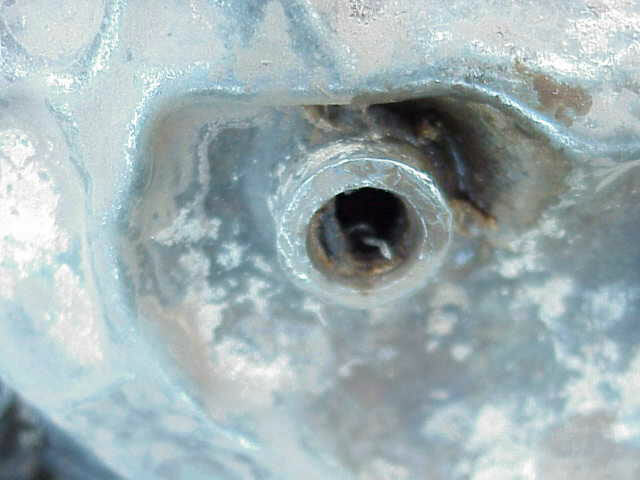 The internal pipes as well as the internal sphere could have held the sub critical amounts of nuclear material (probaly plutonium or even more probably some rare-earth element) and the tubing is there to sinchronize the blast that inicializes the reaction and could have been filled with brizant (ultrafast) explosives. The openings that connects to those pipes could have been the sockets for the high-speed initiator-switches. the 3 hemispherical shapes you can see along the walls could be the shockwave shapers, that focus the blast properly to the innards of teh device. Just by looking at the picture I would estimate that this device would be capable to yield about 1-2 kilotons (just by comparing the inner spere and the pipes Each could have about 85% ofthe critical mass, and if if you merge them that would result resulting in 1.7 in ideal case, but in case of incomplete merging an 1.5 of critical mass might be more realistic, and it could give you approximately such a yield from a plutonium bomb (at least that is what I found on the Web). Have you ever tested the thing for radiation or berrilium? Definetly there is not much of gamma radiation there since it would have showed up on teh X-ray, but what about other types. I just came across your metal orb on the internet. I know what it is. First, take note of the fact that a second interior sphere exists within, and that it is space roughly 1/2 inch from the outer walls. That is clue #1. 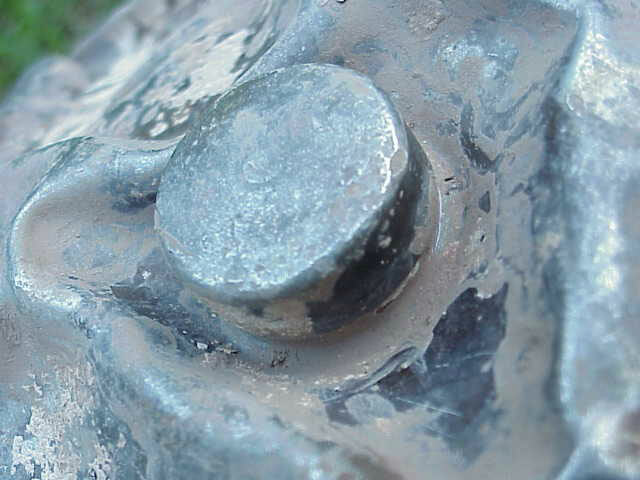 Second, the welded metal cap on the outside is clue #2. 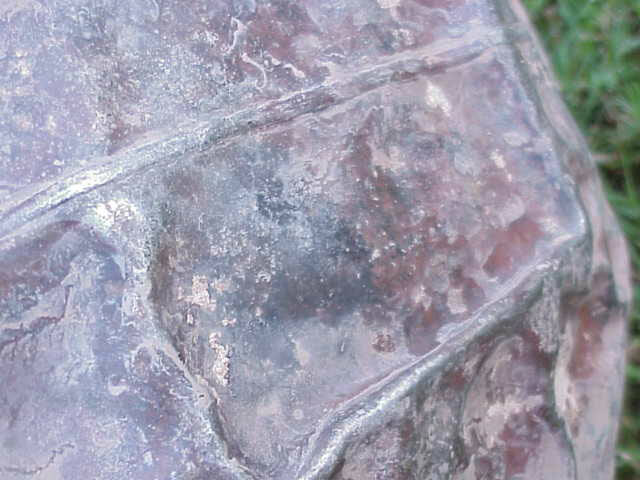 The circular structures between the inner and outer tanks is clue #3. The inner sphere was spaced from the outer sphere for insulation. The welded cap is where a hard vacuum was pulled with a vacuum pump and the cap welded on to prevent leakage. This forms a cryogenic storage device known as a Dewer flask. The sphere is a cryogenic storage tank that uses a vacuum insulated jacket to prevent the warming of the material stored inside. The circular structures are spacers that keep the inner tank from hitting the outer tank. Now, the clamp with the Phillips screw is a grounding point where this crygenic tank would have been fastened to a larger assembly. 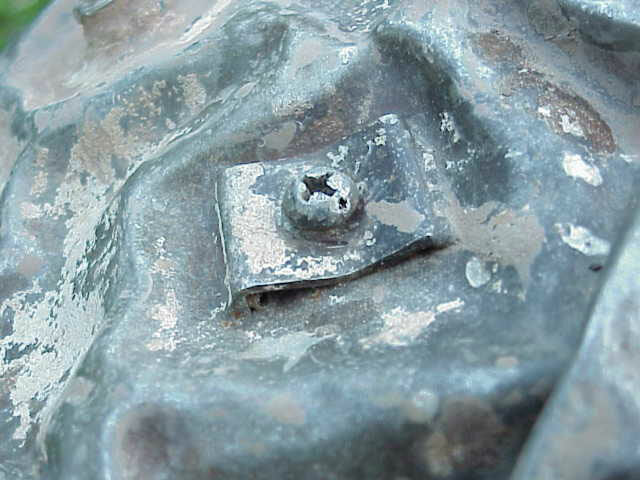 If you examine the underside of the clamp, you may be able to identify some small quantity of copper there, where the grounding cable would have been pulled free. The handle is the mounting point for the tank, and is also referred to as a hard point. The X-ray images show serpentine plumbing that winds about and comes back near the interior surface- this is a clue that the tank was meant to function in microgravity. Gas bubbles would tend to cluster in the center and fluids would stick to the interior. The fittings with the wire or metal rod sticking out are pretty typical air fittings meant to connect to pressure lines. 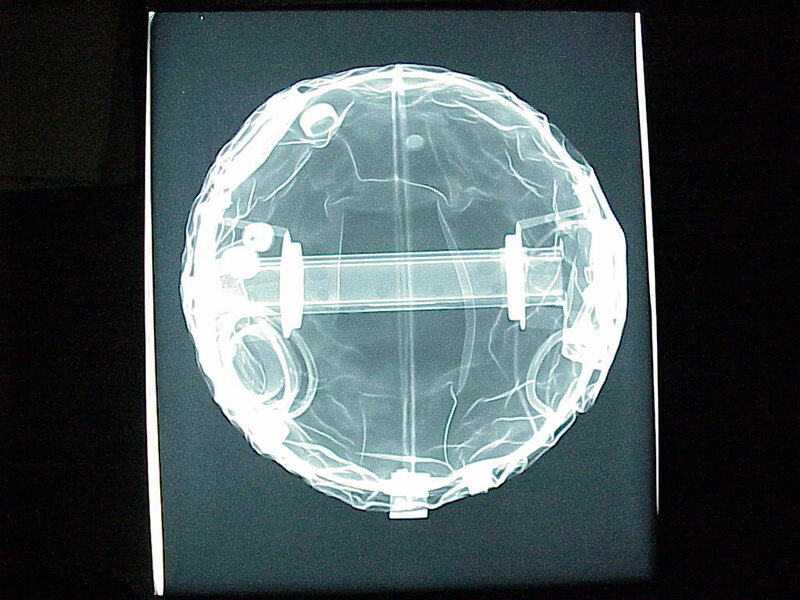 One set would provide pressure into the core of the tank (see the metal cylindrical structure in the X-rays) and the others would allow material to be drawn out of the tank. Usually, the lines themselves would be stainless steel braid exterior lines; often they would also be vacuum insulated. It is very likely that this is titanium. This is clearly the cryogenic storage tank for a spacecraft. It would have held either liquid helium for cooling a sensor or it would have contained liquid nitrogen for the same purpose, as well as use as a pressurized gas propellant. Many satellites will use LN2 as the material for small thrusters, as it boils into a vapor and provides reaction for movement or orientation control. I seriously doubt if this was a fuel tank, bcause the amount of fuel or oxidizer is might have carried is small. However, it clearly has undergone reentry. It might have done so inside the body of a larger craft, which would prevent a great deal of heat damage. 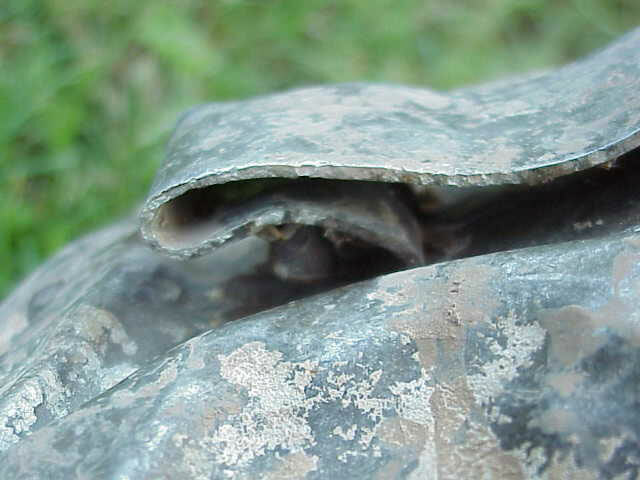 Being buffeted by the outer shell or debris, as well as the high pressure shock waves on reentry, is what collapsed the surface and dented it in. So what you have is a cryogenic storage tank from a spacecraft that reentered the atmosphere- once again, most likely used for liquid nitrogen or helium. I am a fairly regular guest with Art Bell myself and recognized the structure of the tank immediately. I have worked for years in aerospace and debris from space vehicles often contains odd or unusual shaped objects. This is due to the conditions under which they must function, and the limits on space and mass that any spacecraft designer has to work with.